I stepped off the bus in Luang Prabang and hopped into a tuk-tuk to get to the lodge that I had booked for my short 3-night stay. Driving through the town, I instantly had an affinity for the streets humming with people, the stands brimming with fresh fruits and vegetables, and all of the street vendors. My lodge was just off the street where the morning market is set up and a block from the night market, so I was surrounded by colorful wares and delicious smelling food. When I checked into my lodge, the desk manager asked if there were any tours that I wanted to do while I was there. Since my time was so short, I hadn’t planned anything, but asked him to recommend the best one tour. “The Living Land”, he said. It was a tour of a sticky rice farm. I thought, I’ve been eating sticky rice with almost every meal for the past three weeks… it would be good to know a little more about what I’ve been ingesting. It seemed that my time on a farm was not over yet after all. 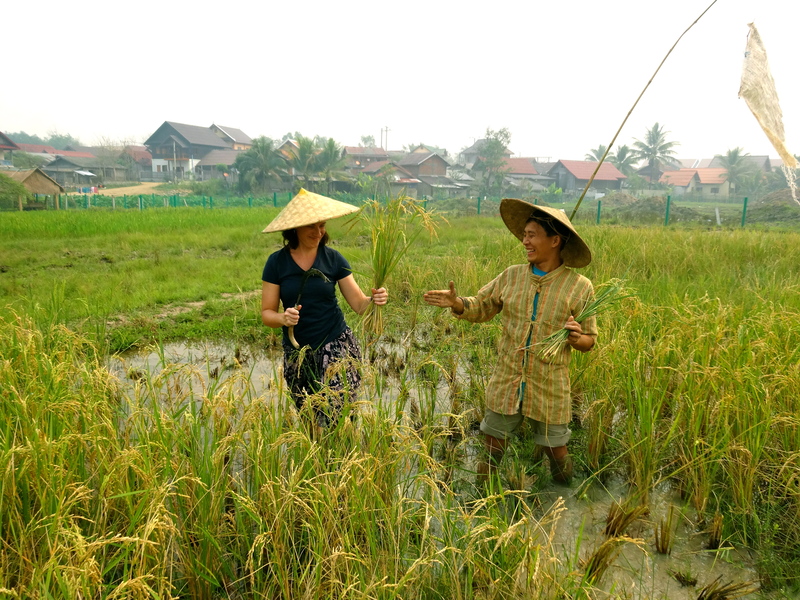 The Living Land farm is located about 5 kilometers outside of town and the tour offers a 14-step education on sticky rice, from seed to table. 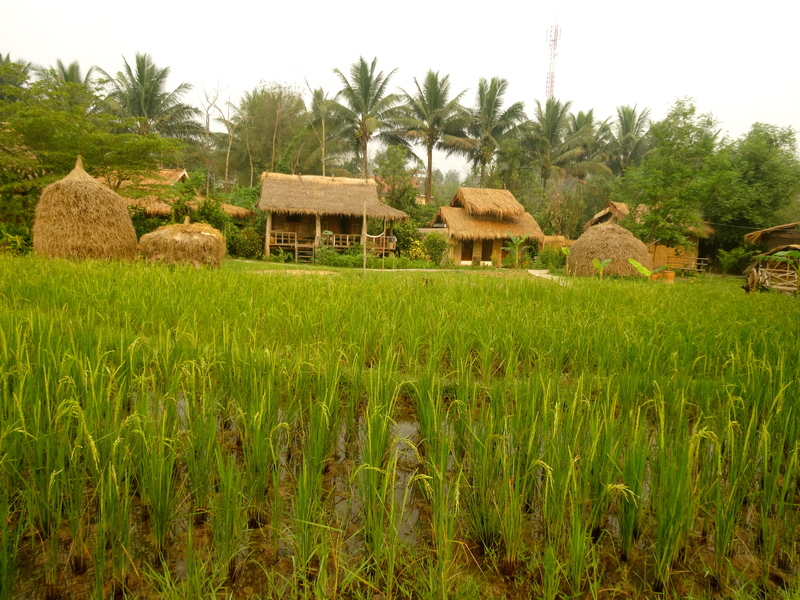 The farm is beautiful with rows of green vegetables, pristine thatched roof houses, and several plots of rice. 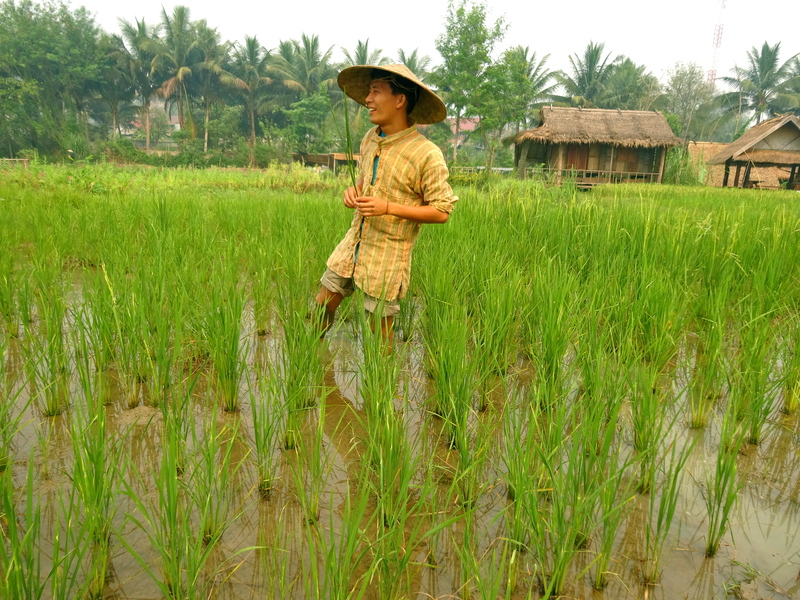 When I arrived, I joined a group of 9 other people and met Laut Lee, the Director of the farm. He started the morning with a cheerful introduction, quickly memorized everyone’s name in the group, and showed us the tools that we would be using that day. After introductions, we were off to start our steps and learn about sticky rice, which as it turns out, is sticky due to the glutinous varietal, and not due to the cooking process. Lee told us that this was going to be a roll up your sleeves and mud up to your knees fun morning, so I rolled up my pants, put on my borrowed bamboo hat, and marched off to the field in bare feet with the rest of our tour group. The egg test to ensure our water has enough salt before testing which will be the best rice to use. Step #1: Identifying the best seeds. This involves filling a bowl with salt water until an egg will float in it. Once the egg floats, it means there is enough salt. Then, add the rice to it and the rice that sinks is the sturdiest and best to use for planting. If it floats, it is still good and means it’s the freshest, but will not grow as well. Once the best rice seeds are identified, Step #2 is Planting the seeds for germination, which simply involves sprinkling them on a mud paddy. 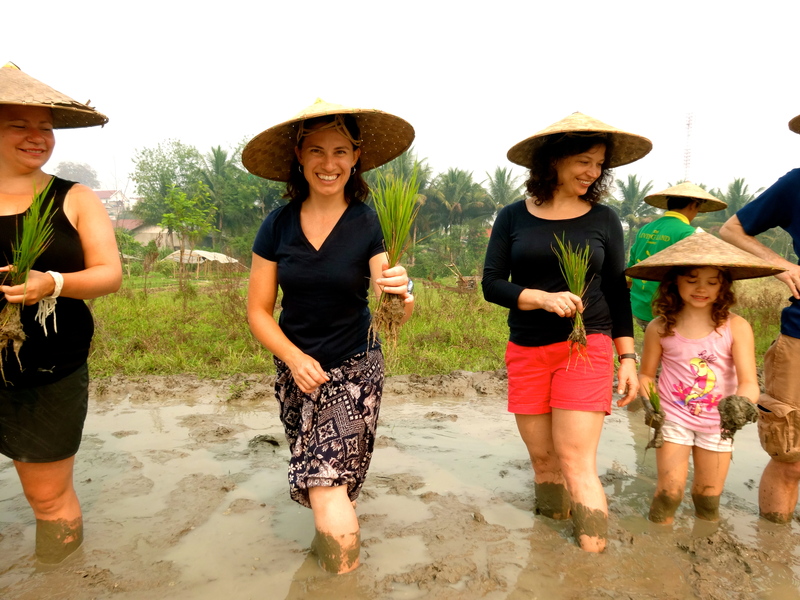 Step #3: Plowing the rice paddy field. It was time for our mud bath… some people pay a lot of money for this at the spa. 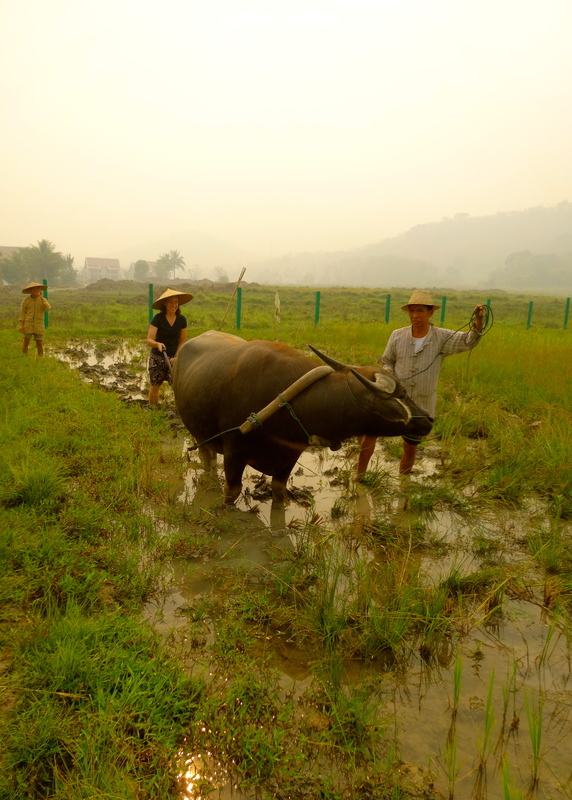 We all got a chance to plow the field walking behind their water buffalo, who, by the way, only responds to two Lao phrases for stop and go, and pauses frequently to pee and poo while we plow. Slightly different than the mud spa experience. Lee only laughs and says not to worry, this is important for fertilization and if the buffalo didn’t poo while plowing, he would have to go find some poo to add to the field for fertilizer. Ah, well, it’s all natural, right? All lined up to plant our rice seedlings. Step #4: Planting. 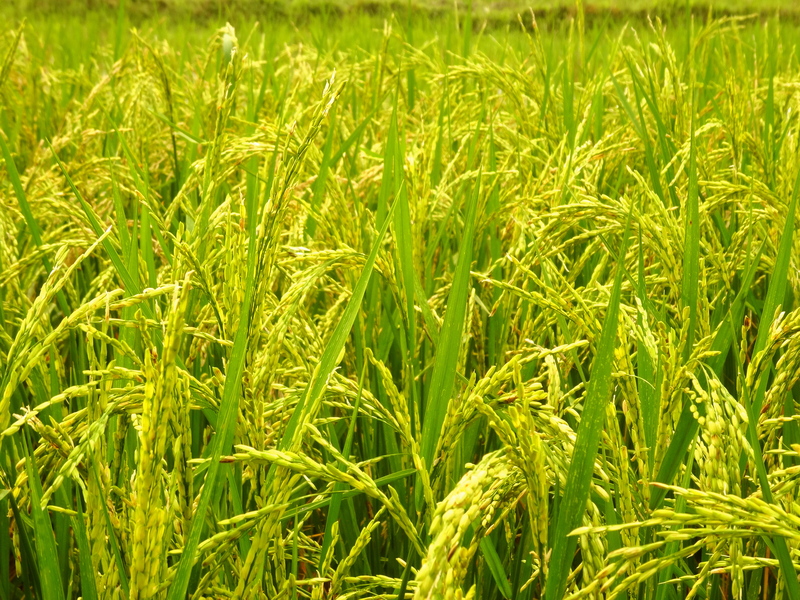 Now that the rice paddy field has been plowed, and the seeds have germinated, it is time to transplant the seedlings into separate, smaller bunches – only 2 or 3 seedlings planted about a hand’s width apart in rows. My row of planted rice seedlings. 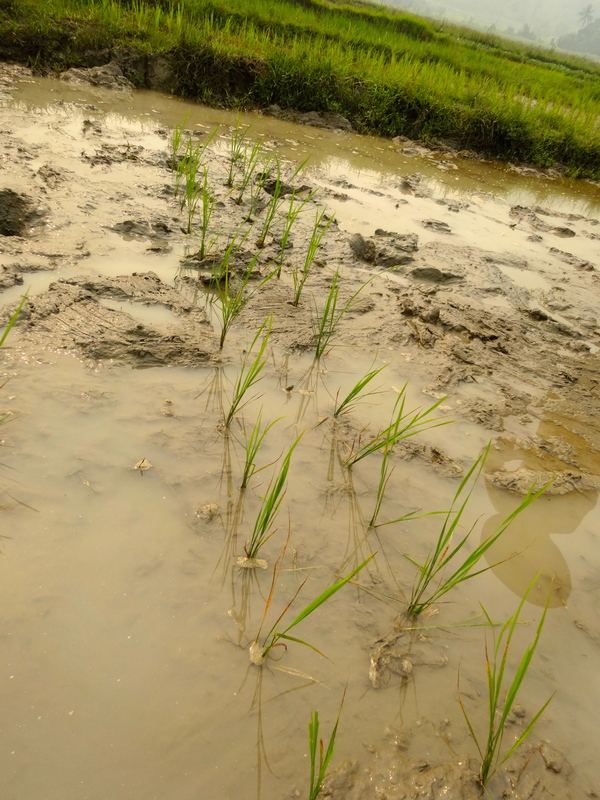 The best way to plant is to start at one end of the rice paddy and walk backwards in the mud planting two rows side by side. Lee does this effortlessly as he shows us, while we all lose our balance a bit in the mud and did our best to create straight rows of rice. Irrigation channels between rice paddies. Step #5: Irrigation and Weeding. It’s important for the rice paddy field to stay wet. 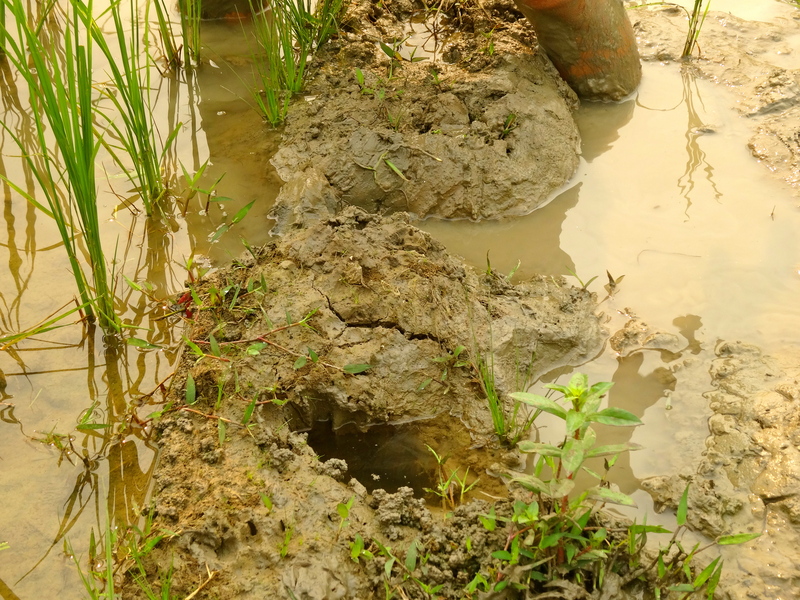 In order to do this, Lee has built irrigation channels that bring fresh water down from a mountain stream, and irrigation is done quite simply by shifting the mud at the edge of a paddy to allow more water into one paddy from another. Weeding also occurs quite easily because the mud is so wet, and weeds can either be pulled up or stamped down into the mud and suffocated. Lee does a combination of both because he likes keeping some organic matter in the soil to make it rich with nutrients. Luat Lee asking me to hand over my sickle after cutting my bunches of rice. Step #6: Harvesting. This requires the use of a sickle. Lee shows us how to cut the rice, bundle by bundle until we have 3 or 4, then tie them up and toss them along the side of the paddy. The bundles are left lying alongside the paddy for a few days to dry out in the sun. Threshing the rice by beating it against a wooden plank. Step #7: Threshing. Once the bundles are dry, they are gathered from the field. 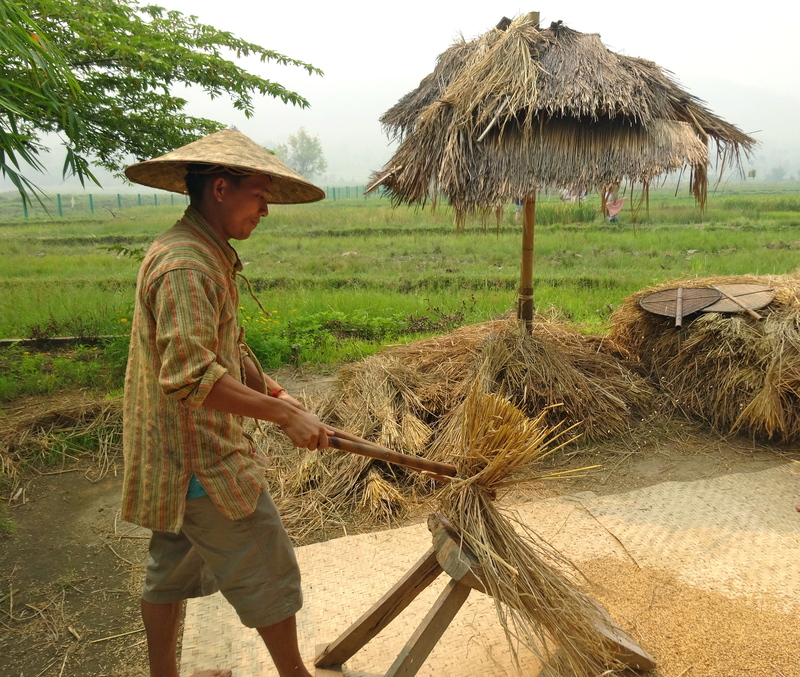 Threshing involves separating the rice grain from the stalk, and basically requires beating the stalk against a wooden board until all of the rice falls off. This seems like a great form of exercise when one needs to let out some aggression after a bad day! 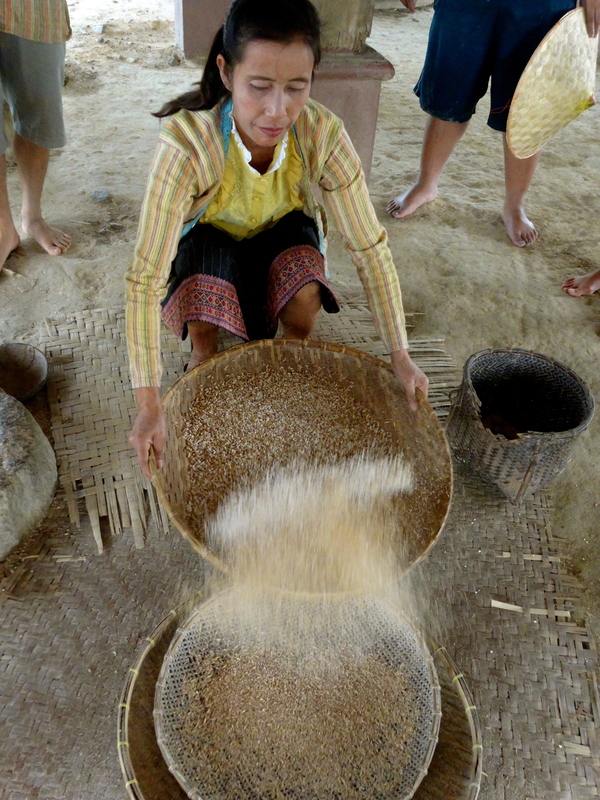 Winnowing the rice with a giant fan to separate it from the stalks. Step #8: Winnowing. Once the rice has been removed from the stalk, it needs to be fanned to separate the empty husks, which often get mixed in with the rice after all of that beating. We use large fans to direct air at the pile of rice and blow the husks away. Lee does this expertly, making it look like a dance while he fans then uses his feet to sweep the pile of rice together, fans more, and sweeps rice. 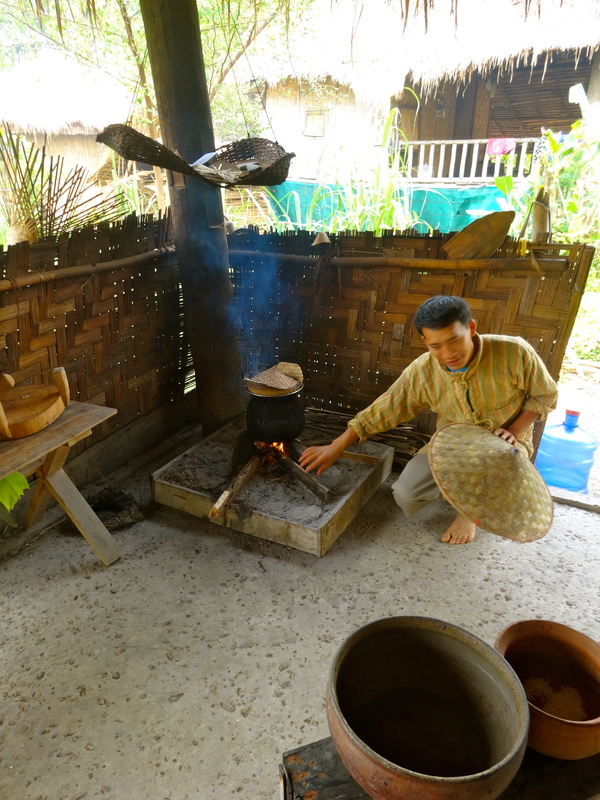 Lee then whisks off his woven hat and scoops the rice grains into a basket for carrying back to the village. Once the rice is separated like this, it can be stored for up to two years in the husks. Lee carrying a basket of rice the traditional way with the strap over his head. Step #9: Transport. 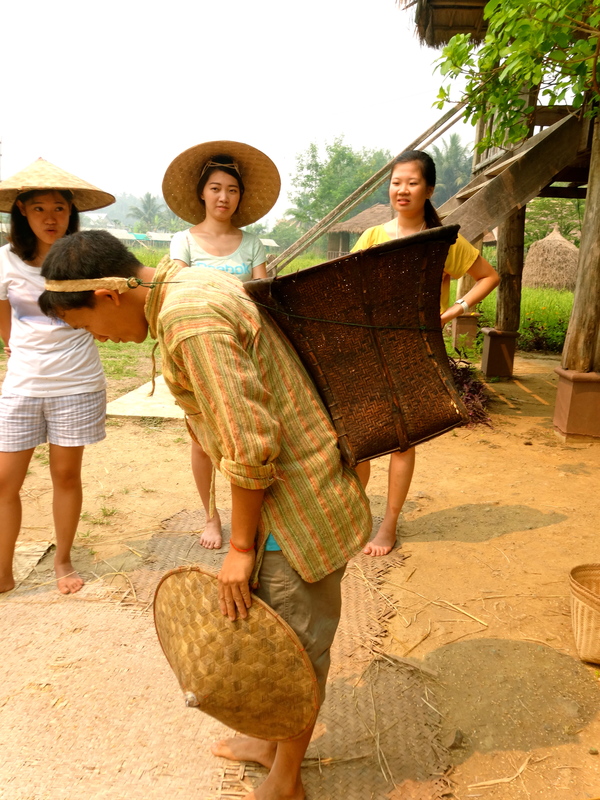 There are many different baskets for carrying the rice… an over the shoulder long wooden carrier with a basket on each end, a simple basket strapped to the shoulders, or the most difficult one, which is a single strap that gets strapped around the forehead. I’ve seen men, women and children carrying baskets like this and can’t believe how heavy the baskets are. There is clearly a technique to this method of carrying that is learned from a young age. My neck and head would be killing me!! Step #10: Milling. This involves a large, wooden arm that is hoisted similarly to a seesaw. Under the far end, there is an arm that falls into a large bowl filled with rice and as the end of the wooden arm pounds the rice, it removes the rice from the shell. Once again, we all try this and it’s about finding the technique and rhythm. Step #11: Separating the shelled rice. 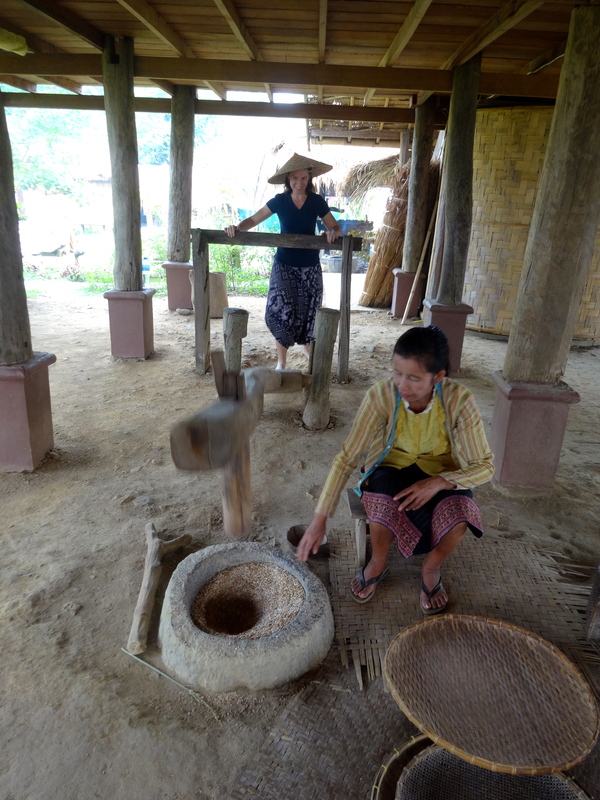 This process is done typically by women who have honed the technique of tossing the rice into the air over a woven circular platter. 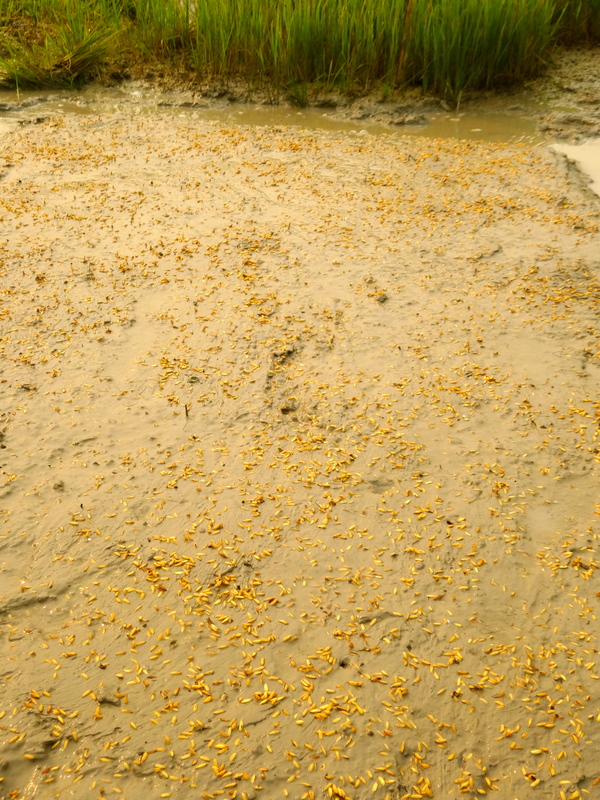 As the rice falls, the shells are blown off the platter. The woman who showed us this technique also swirled the rice around the platter, which forced all of the sturdy white grains to the center and pushed all of the empty shells to the outside so that she was able to scoop up the grains in the middle. Lee explains that if a woman cannot master this technique, it is unlikely that she will find a husband. On average, the people of Lao each eat about 20 kilos (44 lbs.!) of rice per month, so it’s easy to understand why this is important! Lee complimented me on performing this separating technique quite well for my first try and encouraged me to stay and try to find a husband there… hmmm. Step #12: Soaking. Once separated, the rice needs to be soaked before cooking, which should be for a minimum of 3 to 4 hours, but is best when left overnight. Step #13: Cooking – this is done by steaming the rice for about 30 to 40 minutes. As we waited for our rice to be ready to eat, Lee showed us how they turn the rice into rice flour with a giant mill; how they make sugar cane juice; how they weave bamboo into baskets and other tools and toys that they use for their platters, fans, hats, and entertainment for the kids; and how they make all of their own tools at the farm. Of course, we all got to try these activities for ourselves and let’s just say that our group will need a lot more practice. Sharing and eating our sticky rice in all it’s delicious forms! Step #14: Eating! Enjoying the fruits of our labor. 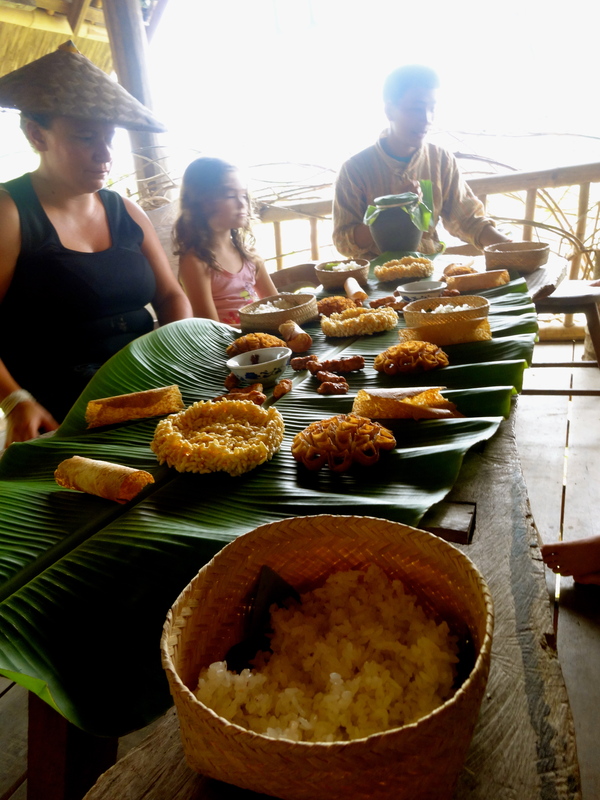 When we all sat down to share our freshly cooked sticky rice, Lee had laid out a bounty of different rice concoctions for us to try. 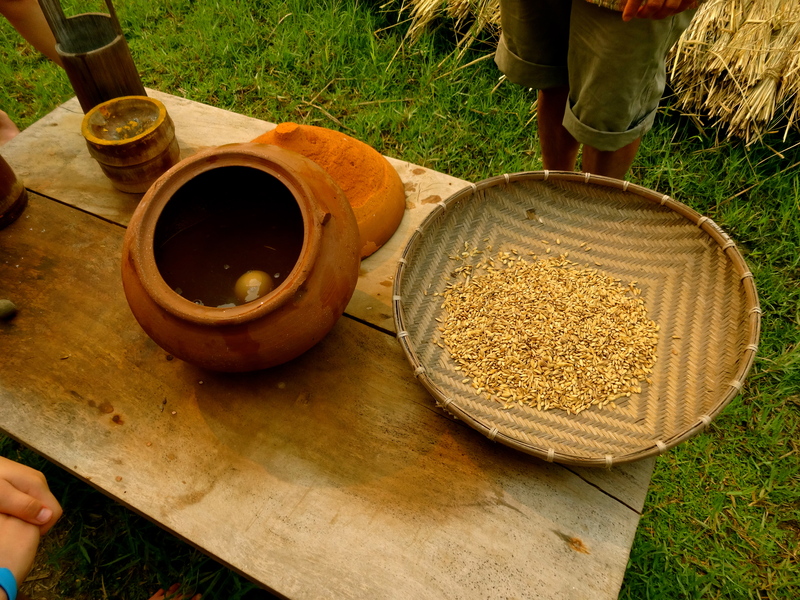 There was a delicious variety that went well with the home brewed rice wine that Lee shared with us. Lee was impressive and engaging, spoke English well, and was able to cater to the two kids in our group as easily as he catered to the adults. Laut Lee, Director of The Living Land, in his element. While learning the process of seed to table was interesting, what was even more fascinating was Laut Lee’s story. Lee grew up in the mountains about five hours north of Luang Prabang, hunted for his food every day in the forest and did his best to help provide for his family. He didn’t have much opportunity for school and if he had stayed there, he would have lived a very simple, and likely meager life. As we ate our rice treats, I asked him more about his story and he explained that while hunting one day, he observed planes flying over the mountains headed for Luang Prabang, and he thought, “I want to go there”. During his teenage years, he found a way to get to Luang Prabang, engage with the local community there, and slowly form his vision. Fully grown rice stalks ready for harvesting. The Living Land is a cooperative run currently by about seven families. This farm employs local workers who have poor education and may not be able to find a job elsewhere. The farm also helps to fund schooling for children, educate 3rd year students from the local agricultural college for free, and works with the Department of Agriculture to run rice trials. They have successfully proven that they can grow higher yield crops without fertilizer through the use of their techniques. Additional involvement includes several other community projects for sanitation and water drainage. It was Lee’s determination, work ethic, and passion that was the most impressive. Laut Lee is not only the Director of this farm, but he still goes to college and will have to do so part time for about another six years until he is able to finish his teaching degree. He hopes to continue to expand this cooperative and further his involvement in the local community through the help of the outside support that the cooperative receives through tours. They also offer home stays and special events on the farm. The cost of the three and a half hour tour that morning was about 344,000 kip, or $42, which is a little pricey for the area, but well worth the experience and the support that it will help to provide. If you’d like to learn more about The Living Land experience, you can visit The Living Land. 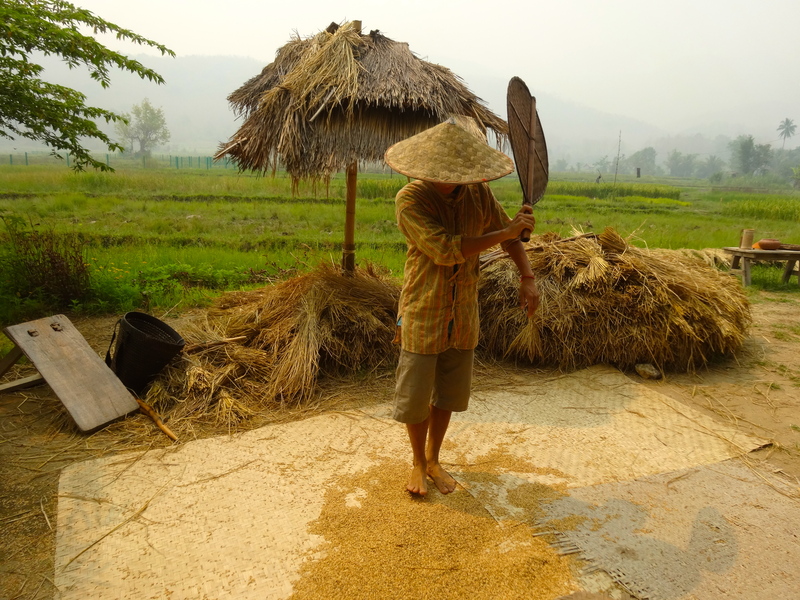 My morning of learning about sticky rice made me appreciate the labor of love behind the harvest and Lee’s story is one that I was compelled to share. Also, in the majority of my hazy pictures, the gray that can be seen in the background is the smoke that hangs over Luang Prabang from all of the slash and burn farming that is done in Laos, as explained in my last post, Slow Growth – Volunteering in Vang Vieng. So, supporting a cooperative like this one that teaches better agricultural techniques to students, who will hopefully build a brighter (less smokey) future for Lao rice farming, seemed exceptionally worthwhile. Revelling in gratitude for those with big dreams and the determination to achieve them!